This photo of Devin Gardner in an Oregon State uniform [via MLive], a special "no contact" jersey which he will wear for tomorrow's spring game, got me thinking (which is never good). 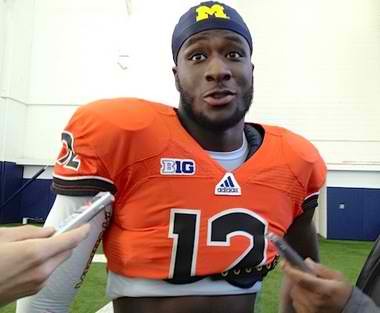 You'll notice that Oregon State's jersey fits a little differently than the usual Michigan uni. And that's because it's not an Adidas jersey, it's a Nike jersey. With an Adidas patch sewn on it. Turns out, Michigan needs to keep it's one remaining scholarship QB safe right now, and for reason's not given, didn't have an alternate-colored Adidas jersey for him to wear. So, UM equipment manager Jon Falk called up a good friend of his at Oregon State and had an orange #12 shipped right over. In the fall of 2008, Michigan began an 8-year contract with Adidas that would pay the university $7.5 million a year...nearly doubling what the previous contract from Nike was worth. In exchange, Adidas would outfit all varsity sports with jerseys, shoes and apparel. For Adidas, it was a huge get. Michigan is a brand that sells tons of merch. For Michigan, it means more $$$ in the coffers of #1000SSS. 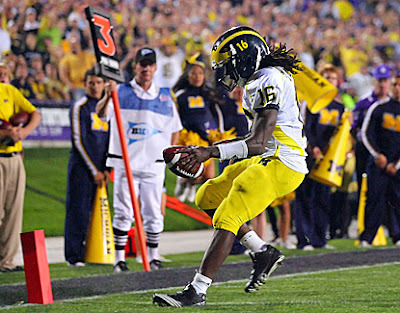 And, relations between Michigan and Nike, at that time, had been strained to say the least. Here's my list of reasons that mean something to me, and maybe something to you. • Overall appearance. I'll admit, I think Nike does a better job with the fit and finish of their uniforms. They just look nicer...and they usually all match, which is a plus. Nike is a bigger brand in college football, no question about it. Two thirds of all NCAA football schools are outfitted by Nike. Whether they're "cooler" is up to you – everyone has their own personal tastes. But it would seem to me that even most Michigan fans prefer the Nike swag to the Adidas stuff....t-shirts, hats, jackets, etc. • Design. Uniform design should not be like rocket science at Michigan. The home jersey is simple, and should never deviate from the blue jersey and maize pants...evar. I'll give these new Adidas socks a pass, but would love to see the famous Twin City Socks make a comeback. They were a player favorite and a Michigan tradition. For some reason, they were switched mid-2012. The away jersey, however, has taken a beating. And that brings me to my last point. • Consistency. The hoops squad had uni issues this year when Glenn Robinson III's jersey ripped on the road. Michigan didn't have replacement jersey with his number. That's unacceptable. Football away jerseys have also been a mess. For the last two years, when Michigan plays on the road, it hasn't been hard to notice that not all of the player's jerseys match. Piping is different, maize side panels don't match...not what you would expect from Michigan, and not what Michigan should expect from Adidas. Aside from all of the superficial reasons I just stated, there is a groundswell of resentment by the university community for the practices Adidas employs in the manufacturing of their products. A crowd of students gathered in front of the Cube by the Fleming Administration Building yesterday, anxiously awaiting for the moment they would bring their sealed message and large pair of scissors to University President Mary Sue Coleman’s office — symbolizing their desire for the University to severe sponsorship rights and license athletic apparel agreements with Adidas. United Students Against Sweatshops — a student organization that works to prevent Fortune 500 companies from abusing their workers — started their criticism of Adidas when the company inexplicably shut down one of its factories in Indonesia without compensation for their laborers last April. The action violated Adidas’ contract with the University because the company disregarded the University’s pre-established code of conduct that requires that all workers must be compensated. Michigan has the option to extend the current agreement with Adidas beyond the 2016-17 season for another 5 years should they decide to do so. Why conduct a poll at the end of an article where you give all the reasons why you feel Michigan shouldn't continue doing business with Adidas? Personally, I like the Adidas logo now (I didn't at first, but it has grown on me) and don't want to go back to the old tired swoop. And I'm sorry, why are you even concerned about socks? If the coaches are complaining to Brandon about these things, I'm sure he will knock some heads together over there and fix 75% of the issues you raised. The rest doesn't really matter much. 1) Why did they have to modify the classic jerseys with the yellow piping? 2) They're alternate jerseys are light years behind what UA and Nike are putting out. And if you don't think that affects recruiting, then you must be over 35 years old and out of touch with reality. 3) The Adidas era coincides with the downfall of the program (the RichRod era). Get rid of Adidas ASAP! If Michigan wants new and younger top 100 recruits They have to fall in line with the jones. Meaning they need to get better and more uniforms.Everyone keeps saying tradition but tradition not bringing better Talent in to play for Michigan. Some people go to Oregon and other schools for the look.